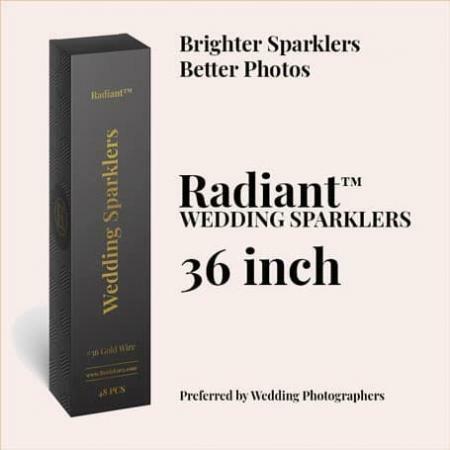 Engineered for better wedding send off photos, Radiant™ wedding sparklers are the preferred brand of choosy brides and top wedding photographers.We offer two sizes. 36″: 3-3.5 minute burn time, 36 inches long, 48 pieces per box. Scroll down and click one of the “view product” buttons below to learn more. Considering a wedding sparkler send off for your big day but not sure where to start? We have you covered in this informative guide to all things relating to wedding sparklers! Read on to learn everything you need to know before you start planning a wedding sparkler send off of your very own. Learning a little bit more about what, exactly, wedding sparklers are, how they work, and their history in weddings, will help you decide if a wedding sparkler send off is the right fit for you. In this section we take it back to the basics and answer some of the most common questions we hear about wedding sparklers. First things first. . . . what are sparklers? A sparkler is a type of firework that is specially created to slowly burn, resulting in a shower of beautiful sparks that illuminates the space around them. What makes a sparkler sparkle? To answer this question, you’ll need to dust off your high school chemistry book and put on your thinking cap. The combination of these four elements creates a sparkler. When lit, the oxidizer compounds in the wedding sparkler begin to decompose, producing oxygen. This reaction “forcibly ejects bits of the burning powdered metal from the sparkler,” which creates the luminous and magical sparkle created by wedding sparklers. Check out the graphic below from CompoundChem if you’d like to see the science behind a sparkler! What makes a sparkler a wedding sparkler? Chances are you’ve probably used sparklers at some point in your life. Most likely, at a Fourth of July cookout or a New Year’s Eve soiree. However, there are some key differences between regular sparklers and wedding sparklers. The main difference is that wedding sparklers are typically manufactured with a steel wire core, as opposed to a bamboo or wood core. This small difference has a pretty major impact on the finished product — resulting in a much longer burn time and a virtually smokeless burn. These two key features make wedding sparklers ideal for use during wedding send offs. Some of the reasons for this include. . . . Even if you aren’t a professional photographer, you can probably see why the longer burn time and smokeless nature of wedding sparklers results in higher quality photos. The longer burn time gives the photographer extra time to capture the perfect shot and also ensures that all of the sparklers stay lit for the photos. Meanwhile, the lack of smoke and ash, results in clearer photos that you will treasure for many years to come. When it comes to wedding send offs, timing is everything. And thanks to a longer burn time wedding sparklers are key to ensuring perfect timing. With traditional sparklers the first sparklers lit may have already burned out by the time your last guests have lit their sparklers. By choosing wedding sparklers you can guarantee that your send off is seamlessly executed and that you joyous send off won’t fizzle out before it’s even begun. Unlike traditional sparklers, wedding sparklers do not create ash and residue as they burn. This has multiple benefits for weddings. First of all, you won’t need to worry about getting ash on your dress (or your guests!). If you choose to add a sparkler topper to your cake, you won’t have to worry about ash ruining your cake. And ultimately, the lack of ash will result in easier clean up following your big day! Remember that chemical reaction mentioned above that causes the magical glow? Our Radiant™ sparklers come packed with extra ingredients to ensure that the glow is ultra-bright. Check out the videos below to see the difference! It is thought that fireworks originated in China during the sixth century with the first sparklers developed by an architect from Heliopolis around AD 670. These primitive sparklers eventually evolved to become the modern day ones we use as a part of celebrations today. How long have sparklers been used in weddings? Although sparklers have been around for thousands of years, they have only become a popular part of wedding send offs in more recent years. The history of wedding send offs dates back to the ancient Romans, with rice and grain as a central part of the tradition. However, wedding exit traditions have evolved and changed over the years, with alternatives such as wedding sparklers, bubbles, glow sticks, flower petals, and even smoke bombs increasing in popularity. Some credit this shift away from rice to a false theory that the tradition was harmful to birds. This rumor was quickly discredited, but the popularity of alternative send off options has continued. With so many purchasing options available, it can be hard to figure out the best type of wedding sparklers for your grand wedding exit. Fortunately, it isn’t rocket science (or is it?!) and boils down to three main factors: quality, quantity, and size. One question we often get asked is about the difference between cheap and expensive wedding sparklers. And our answer is always the same. It isn’t about price, but rather quality. When shopping for wedding sparklers price is obviously an important factor. However, you should be more concerned about purchasing high-quality sparklers that will ensure your exit goes off without a hitch. Typically more “expensive” sparklers are higher quality sparklers that will shine brighter, burn longer, create a smokeless and ashless burn, and keep you and guests safer. This element is key to ensuring a smokeless and ashless send off experience for you and your guests. Yes, it may cost more, but the bamboo or wooden cores used in cheap sparklers will result in a smokey send off that will ruin photos, damage clothing, and cause a mess for the cleanup crew. Contrary to popular opinion, it is not the length of the sparkler, but rather, the length of the flammable compound that is key to longer burn time. Again, this will lead to a higher price but is worth every penny since many cheaper sparklers lack this critical element. A strong core is another element that sets expensive sparklers apart from their cheaper counterparts. It might not sound like a big deal, but a strong core is a critical part of sparkler safety and majorly reduces the risk of accidents. This means instead of just looking for a steel wire core, it is important to look for a stronger gauged steel that is not found in cheaper models. The answer is that the best size for wedding sparklers depends on the specifics of your wedding send off, including the number of guests, how long you want your send off to last, your goals, lighting time, and if you plan to pose with sparklers for photos during your send off. Once you’ve purchased the correct quantity of quality wedding sparklers, it’s important to know how to actually USE them for a wedding send off. Below are our expert answers to some common questions on wedding sparkler use and best practices. How do you use a sparkler? Using wedding sparklers is all about knowing how to light, use, and dispose of them in a safe manner. When guests light sparklers, ensure they are in an outdoor space where they have plenty of space to light and burn their sparklers without the risk of injury. You should ensure there are plenty of lighters to go around. Once the send off is complete, sparklers should be safely disposed of in buckets of water or sand. How do you light sparklers at a wedding? When it comes to lighting wedding sparklers, we’ve tried everything from matches to grill lighters. However, in our opinion, one option stands out as the most effective method for lighting wedding sparklers — butane torches. We suggest butane torches for multiple reasons including they are easy to use, effective, and extremely safe. How do you write with sparklers? Writing with wedding sparklers is not only fun. It also makes for absolutely breathtaking wedding photos. If you want to try it for yourself, here are a few tips and tricks on how to write with sparklers. How do you get sparklers to show in photos? Although most wedding photographers are well versed on how to take the perfect wedding sparkler photos, it can be a little tricky for those of us that aren’t pros. Fortunately, we’ve learned a thing or two over the years and here are our best tips we’ve found on how to get sparklers to show in photos. How do you do long exposure with sparklers with a camera? According to Hallmark’s Think Make Share blog, which highlights all things creative, the below steps are key to photographing sparklers with a traditional camera. If you opt for a camera, be sure to use a camera that allows you to adjust the shutter speed. Play around with the shutter speed. Start with three seconds and if the photo turns out to be too bright, increase it to two seconds. Meanwhile, if the image comes out dark, decrease the shutter speed to four seconds. Don’t want to mess around with an actual camera? There are now a variety of apps that can be used to adjust the shutter speed of your smartphone camera. If you opt for this method, we suggest starting with a shutter speed of 15 seconds and adjusting accordingly. If possible, you will still want to use a tripod, or find a steady surface to rest your phone on for the best results. We get a lot of questions on choosing and using wedding sparklers, so we’ve compiled some of the most frequently asked questions here in hopes that they will make your wedding planning a little bit easier. As long as they are stored in a cool, dry place your sparklers should not expire. How do you store unused sparklers? Store unused sparklers in a cool and dry place to ensure they are not damaged. You should also store sparklers in a safe place away from children. How many sparklers should you purchase for your wedding? We suggest purchasing more sparklers than you think you will need since you never know what could go wrong. The experts at The Budget Savvy Bride suggest buying multiple sparklers for each guest to ensure there is plenty to go around when it comes time for the grand exit. When purchasing from a quality retailer, like Bride Envy, you should only need one sparkler per guest, but you should plan to purchase extra for additional photos you may want to take. The best part is, you can always use any leftover wedding sparklers for New Year’s Eve or the Fourth of July! How long will sparklers last? This completely depends on the size and quality of the sparklers that you purchase. As mentioned previously, cheap sparklers tend to have a shorter burn time since they contain less of the flammable compound. The length of the sparkler affects burn time. Bride Envy sparklers burn anywhere from three to five minutes depending on the type you choose. What size sparklers should you purchase for your wedding? You will of course want photos taken of your send off, and the more guests you have the longer it takes to coordinate everyone and have all sparklers lit at once. Having longer lasting sparklers allows you to have some breathing room in case the entire group takes longer than expected to light their sparklers (which inevitably will happen! ), and it will allow you to take more photos of your send off. How long does a 20-inch sparkler last? Depending on the quality of the product you purchase, the longest burn time for a 20-inch sparkler is about two minutes. Bride Envy sparklers come in boxes of 48. Wedding sparklers can make the final moments of your wedding extra special — creating a photo-worthy backdrop as you enter your new life of marital bliss. However, before planning a wedding sparkler send off, it is important to familiarize yourself with wedding sparkler safety and laws to guarantee the perfect ending to your perfect day. Wedding sparklers are beautiful and fun, but it is important to remember that you are literally playing with fire when using them! Keeping this in mind, it is critical to follow some common sense fire safety tips when handling. Yes – when used properly. Nevertheless, it is important to remember that sparklers are fireworks and can burn at temperatures as high as 2,000 degrees Fahrenheit! Because of this, it is important to use caution when handling sparklers. Can sparklers be used indoors? Whether or not sparklers can be used indoors depends on the type of sparkler you purchase. Smokeless sparklers with a steel core can be used indoors, but cheap sparklers with a bamboo or wood core should never be used indoors due to a lack of ventilation. Can sparklers be used to start a fire? If used incorrectly sparklers can start a fire. This is why it is so important to follow strict safety guidelines when using and disposing of wedding sparklers. Yes – as mentioned previously, sparklers can reach 2,000 degrees Fahrenheit, a temperature that is hot enough to melt certain metals. However, you can minimize the risk of burns by following common-sense safety when handling sparklers. How do you safely dispose of a used sparkler? Once your send off is complete it is key to properly dispose of them to avoid burn or fire risks. The safest method of sparkler disposal is having guests place sparklers into buckets of water with the hot side facing down. Now that we’ve answered the top questions we hear on sparkler safety, here is our list of the top tips for a safe and joyous wedding sparkler send off. Ensure there is plenty of space. It is recommended that guests handling sparklers stand six feet from one another. Purchase high quality wedding sparklers, not cheap 4th of July sparklers. Carefully supervise children if they are using sparklers. Never wave or throw sparklers. Always properly dispose of sparklers. Before planning a wedding sparkler send off you should always research the laws and regulations surrounding sparklers in your state, county, city, and municipality. Below we discuss the answers to some of the most common questions we hear surrounding wedding sparklers and the law. Within the United States, the laws around fireworks (and sparklers) vary depending on your geographic location. The legality of sparklers varies based on not only state law, but also counties, cities, and municipalities. Some laws also limit the purchase and use of sparklers to specific dates and holidays (e.g. New Year’s and the Fourth of July). Where are sparklers illegal in the US, if any? Massachusetts is the only state that bans sparklers, while Illinois and Vermont only permit the purchase and use of sparklers with wood or bamboo cores. You can find a complete directory of laws on the American Pyrotechnics Association website. Are sparklers illegal in California? California is one of many states that permit the use and sale of “safe and sane” fireworks, including non-explosive and non-aerial fireworks, such as sparklers and novelties. However, specific laws vary depending on city and county regulations. Can I bring sparklers on a plane? For this reason, wedding sparklers are shipped through ground transportation only. How old do you have to be to buy sparklers? The legal age to purchase sparklers varies depending on where you live. Sparklers are a type of novelty firework. Why can sparklers only be shipped through ground shipping? Sparklers can only be shipped using ground shipping due to the fact that they are flammable. Now that you know the history of sparklers, know how to tell between a low-quality and high-quality sparkler, and are an expert at firework safety, it’s time to buy. Interested in purchasing high-quality wedding sparklers from Bride Envy? Click here to choose your size!